A friend of a teenager accused of murdering a man in a Peterborough street told a jury ‘time stopped’ when she realised what had happened. Zofie Fedakova told Cambridge Crown Court yesterday she had known Martyna Ogonowska (18) for several years before she stabbed Filip Jaskiewicz (23) to death in a car in Oakdale Avenue, Stanground in the early hours of October 21 last year. Miss Fedakova said she heard ‘a thumping sound’ while they were sitting in Mr Jaskiewicz’s parked car - before Ogonowska got out of the car and ran. Miss Fedakova followed, and today she told a jury she ‘still couldn’t understand what happened’ as she said Ogonowska had fled the scene carrying the blood soaked knife. The court heard Mr Jaskiewicz suffered one, fatal stab wound, which pieced his heart after he had argued with Ogonowska. Miss Fedakova told the court she had met Mr Jaskiewicz on Friday, October 19, and the following day she went to a party at Ogonowska’s house. The party was to celebrate Miss Fedakova’s partner, Peter Csisco’s birthday. The party started in the afternoon, but Mr Jaskiewicz arrived at around 9pm, with a bunch of flowers for Ogonowska. Miss Fedakova said Ogonowska described Mr Jaskiewicz as her new boyfriend. She told the court while at the party she spotted a knife in the living room on a plate with some food - she said she carried iot into the kitchen and left it by the sink. Later in the evening, the group went to The Solstice bar with Ogonowska’s mother. Miss Fedakova told the court Ogonowska’s mother was carrying a blue bag, which she said contained alcohol. The bag was left in bushes near the club. The prosecution say it is possible the knife was kept in the bag - but they also claim Ogonowska could have secreted the weapon in her bra. After the group left the club at about 2am, they all followed Mr Jaskiewicz to his car. Miss Fedakova said he started driving - at first within the speed limit, but later he was speeding. She said she started panicking, and Ogonowska was scared because of the speed, and because she didn’t know where they were. She said Ogonowska started crying. The car eventually pulled up in Oakdale Avenue, and Miss Fedakova said Ogonowska got out, followed by Mr Jasciewicz. She said he grabbed hold of Ogonowska with one hand, and threw her to the ground. Miss Fedakova and Mr Csisco both got out of the car to calm the situation down, and eventually they all got back in the VW Polo, with Ogonowska sitting in the front passenger seat next to Mr Jaskiewicz. She said she saw Mr Jaskiewicz put his hand under Ogonowska’s shirt, and she ‘threw the hand away.’ She also saw him put his hand on her thigh, with Ogonowska putting her hand on his. She said: “That was the last thing I saw. “The next thing there was a thumping noise, like someone hit somebody. It was not lie a slap - it was harder. There was only one noise. She added: “She was running, not looking where she was going. She was screaming ‘lets go, lets go.’ I could see she was not alright. “She was shaking, she was stammering. When I asked what happened she didn’t manage to say. Once she stopped she showed me a knife which was all covered in blood. “I couldn’t understand it and I still can’t believe it. Ogonowskae, Miss Fedakova and Mr Csisco then all got in a taxi to an ex-boyfriend of Ogonowska’s house. Miss Fedakova said the knife was washed while they were there because Ogonowska felt sick. 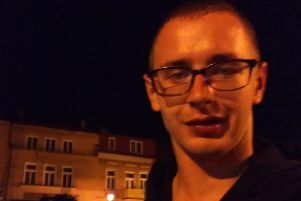 Ogonowska, of Victoria Place, Peterborough denies murder and possession of a knife in a public place.